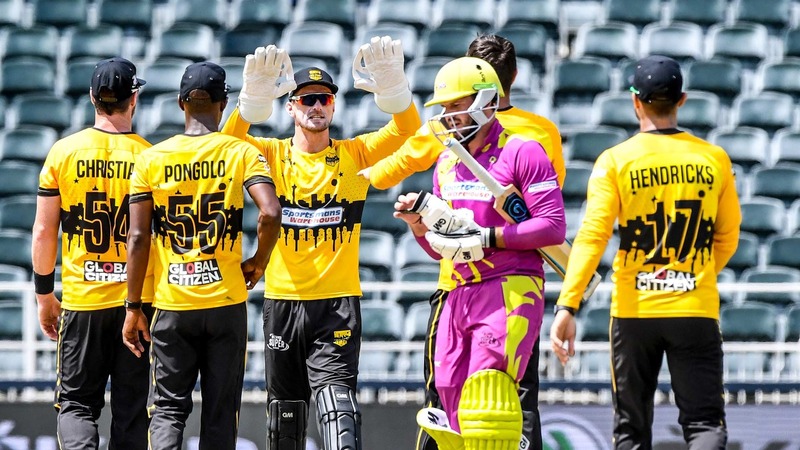 It was the 120-run stand of Thompson and Faf Du Plessis that led the Paarl Rocks to a 6-wicket convincing win over the high flying Jozi Stars. In defence of 170, the Jozi Stars started off well with Duanne Olivier getting back to back wickets of Cameron Delport (15) and Aiden Markram (3) in the third over. The Stars joy was short-lived when Du Plessis and Thompson combined for a match winning century partnership with Du Plessis scoring 61 (34) and Thompson (75 of 55). The Paarl Rocks were cruising to victory when Dan Christian broke the Du Plessis-Thompson stand giving the home side some hope of a late comeback. A couple of balls later Olivier trapped Patrick Kruger lbw for 1 but it was all little too late as the damage had already been done by the top order with Dwayne Bravo hitting two sixes and a four to end the match. Olivier was the pick of the bowlers with figures of 3-30 but it wasn’t enough to restrict the Paarl Rocks as the Stars suffered their fourth loss of the tournament. Earlier on the Jozi Stars posted 170-6 in their20 overs. The Paarl Rocks were off to a good start picking up two wickets inside the first six overs to leave the Jozi Stars on 39/2 with the dangerous Reeza Hendricks (5) and Chris Gayle (9) back in the heart cheaply. It was the forever reliable Rassie Van der Dussen and captain Dane Vilas who stabilised the innings with their 50-run partnership as the Stars reached the half way point on 71-2. The visitors continued to keep things tight with Shamsi finally getting the all-important breakthrough for Rocks when he bowled Vilas for a run-a ball 23. Pretorius played a little cameo of 28 of 17 balls with Van der Dussen finishing on 83(55) to help the Stars post a decent target of 170-6 in 20 overs after getting off to a slow start. The rest of the batsmen failed to reach double figures. Mungroo was the pick of the bowlers with figures of 3/29. The Stars will be in action on the 11th of December against Tshwane Spartans at the Bidvest Wanderers Stadium.